Cecilia Marshall never imagined that the battle for equal rights in schools and elsewhere would still be as vital today as it was six decades ago when her husband, United States Supreme Court Justice Thurgood Marshall, fought to end legal segregation as a civil rights lawyer with the NAACP Legal Defense Fund. 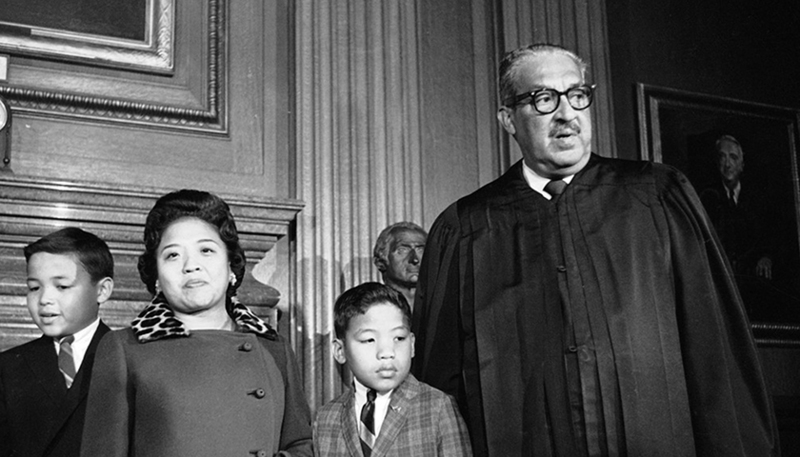 There’s little argument that one of the greatest achievements in the long and illustrious career of the late-Justice Thurgood Marshall, who died in 1993 at the age of 84, was the landmark decision in the 1954 Supreme Court case Brown v. Board of Education. The Brown v. Board of Education lawsuit began as five separate cases filed in South Carolina, Delaware, Virginia, Washington, D.C. and Kansas. The plaintiffs in all of the cases alleged that the civil rights of their children under the 14th Amendment had been violated. On May 17, 1954, the Supreme Court unanimously ruled that separate educational facilities were “inherently unequal” and that racial segregation of public schools violated the equal protection clause of the 14th Amendment of the U.S. Constitution. The Brown v. Board of Education decision came more than a decade before Marshall’s appointment to the Supreme Court. The decision has been credited with inspiring the Civil Rights Movement that unfolded over the next decade and it also led to Marshall being recognized as one of the most successful lawyers in America. Her work continues in her husband’s memory. The event will be held at the Thurgood Marshall Center for Service and Heritage in Northwest, Washington, D.C.
“The problems remain and this event, this anniversary, comes against the backdrop of a significantly troubling retrenchment of access to education for African-Americans, Latinos and other children,” Marshall said. She cited a Leadership Conference on Civil and Human Rights report that said there are numerous factors that appear to have combined to cause the rapid re-segregation of schools since 1991, the year her husband retired from the bench. The courts began turning against desegregation plans in the 1980s—denying new petitions to desegregate schools, ending previous court imposed plans and even striking down voluntary plans created by local school districts, according to the Leadership Conference on Civil and Human Rights, a diverse collective of more than 200 national civil and human rights groups. Further, executive branch agencies topped the aggressive campaign to enforce the Brown decision and the Civil Rights Act that proved successful in the 1960s and 1970s, the Leadership Conference reported. In a statement about the report, the Leadership Conference said that the rapid growth of the Hispanic and African-American populations and growing income disparities have increased the concentration of minorities living in high poverty districts. Leaders from the National Newspaper Publishers Association (NNPA) and others plan to join Marshall at the historic event to celebrate the life and legacy of Justice Thurgood Marshall. Marshall, she said that, she still gathers with the wives of former and current Supreme Court Justices. “We’re a big family, we call ourselves ‘sisters,’” she said. Those get-togethers, as well as the success of her two sons—Thurgood, Jr., and John W. —serve to further validate her husband’s legacy. Ohio Pastor Darrell Scott Convenes “Gang Summit” in Washington, D.C.